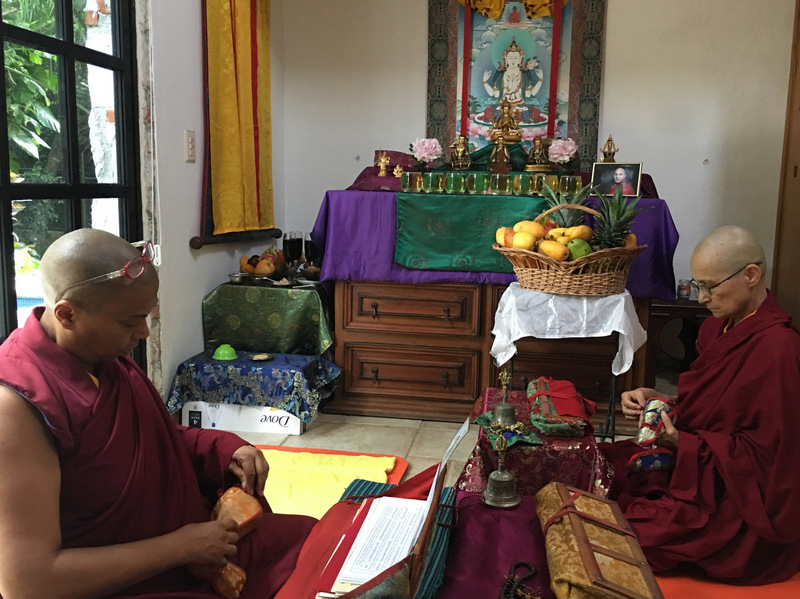 Just as the nuns in our community support one another as we walk the Buddhist monastic path together, we in turn depend entirely on the kindness of others to support us in this life. Without the generosity of those who sustain our bodies and our activities, our spiritual life would be impossible, as would all our opportunities to serve. Life in our community is simple. During the parts of the year that we are in Mexico, we stay on a property in the Mayan jungle that is lent to us rent-free. Our monthly expenses consist mainly of food, utilities (gas, water, electricity), costs of maintaining the property, internet, costs of local travel and medical expenses. Major annual expenses include computer and other electronic equipment needed to record or webcast the materials that we share online, travel within Mexico, airfare for four to and from India or New York, where we travel to see our teachers and continue our training under their guidance, as well as local travel and housing within India and New York and the costs of attending the annual Mahamudra transmission in Delhi. If you would like to supporting our activities and our way of life, you can contribute via credit card or Pay Pal using the following link. Your participation in our community through your donation will be welcomed gratefully. Why do we rely on others to support us financially? The Buddha asked his monks and nuns to subsist on whatever material offerings they were given freely, rather than accept payment for services or engage in other forms of commercial relationship. As professional women accustomed to our financial independence, adopting this way of life required a complete reorientation in our way of relating to others. We had no choice but to work with our individualistic habits of each looking after her personal wants and needs, and open ourselves much more fully to the reality of our own interdependence. This was challenging, and powerful training in recognizing the enormous kindness of others and learning to pursue only aims that are of shared value to others and to ourselves. 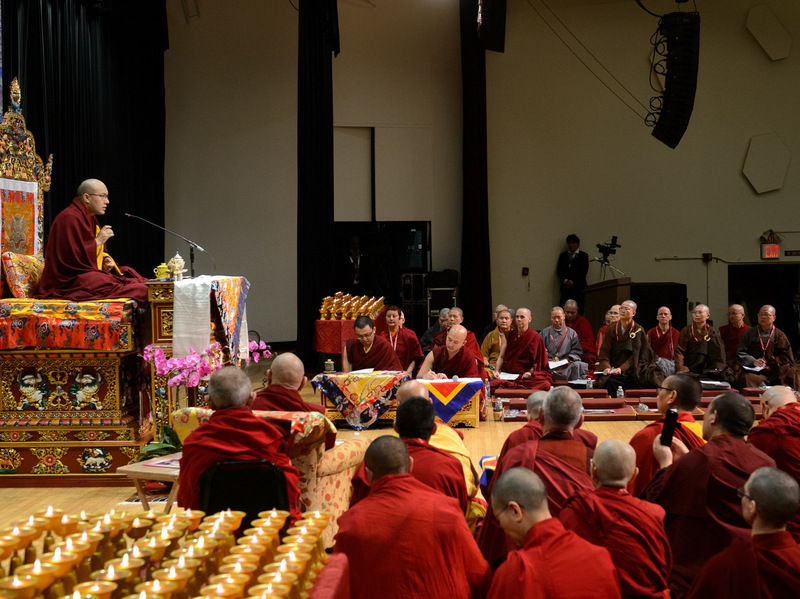 By insisting the monastics live entirely on what laypeople offered, the Buddha created a symbiotic relationship between his monastic community and his lay community. 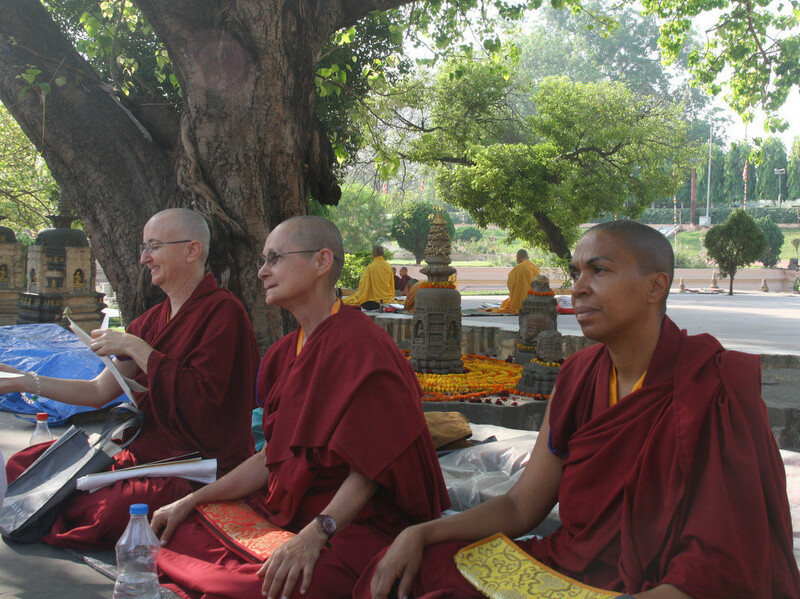 While asking both the lay and monastic communities to practice the Dharma to the fullest of their abilities within their chosen way of life, he especially charged the monastic community with the responsibility of keeping the Dharma alive and continually available in the world, by dedicated their lives entirely to studying, practicing and transmitting the Dharma. The Buddha involved the lay community in this important task by ensuring that the monastics had basic conditions to be able to do so. This arrangement reflects and reinforces the monastic commitment to a life of simplicity and of renunciation. The practice of living on whatever we are offered freely supports us in our active cultivation of an attitude of contentment and appreciation of whatever material support we do receive. In our nuns’ community, we feel the presence of those who sponsor us in all that we do. 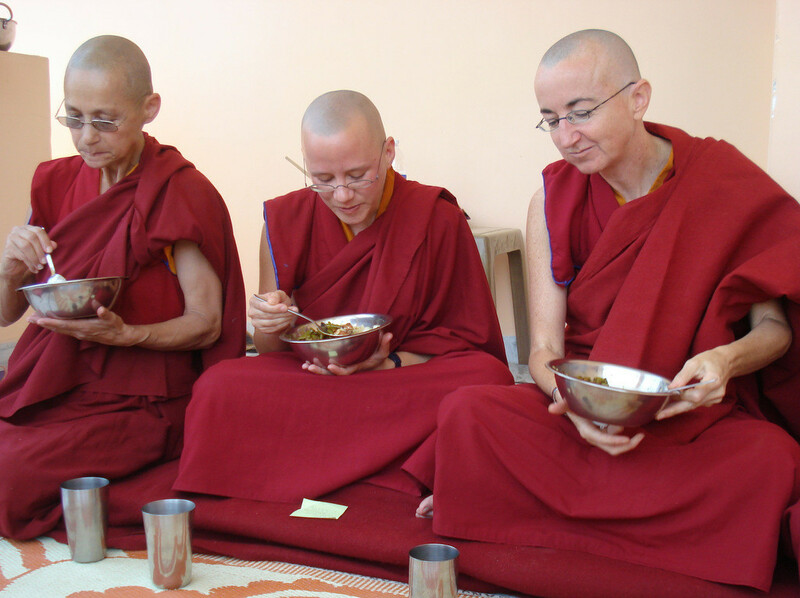 Their kindness makes possible for us something that we treasure beyond words: to be able to devote our lives to the Dharma every moment of every day. Those who support us are participating in our lives at every moment, even though they may not be physically near. Our purpose is a shared purpose, and our lives become lives shared with all those who contribute to it. This heightens our sense of responsibility to use each moment of our lives as if it were a life held in common with them. 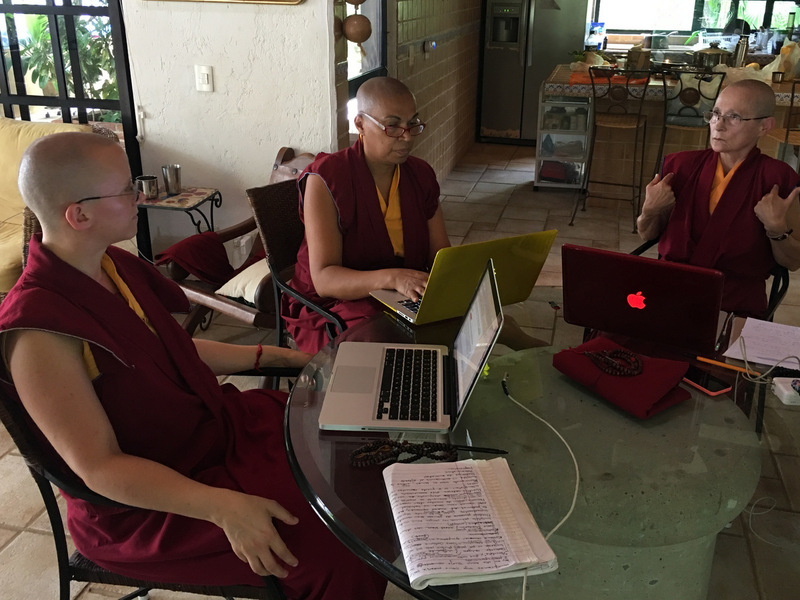 In practical terms, our sponsors have enabled us not only to train ourselves, but to serve through translation and editing work, leading retreats and creating the Spanish-language online educational programs of Instituto Budadharma. We share the fruits of these efforts with them as well. Our time is divided between service, study and meditation. 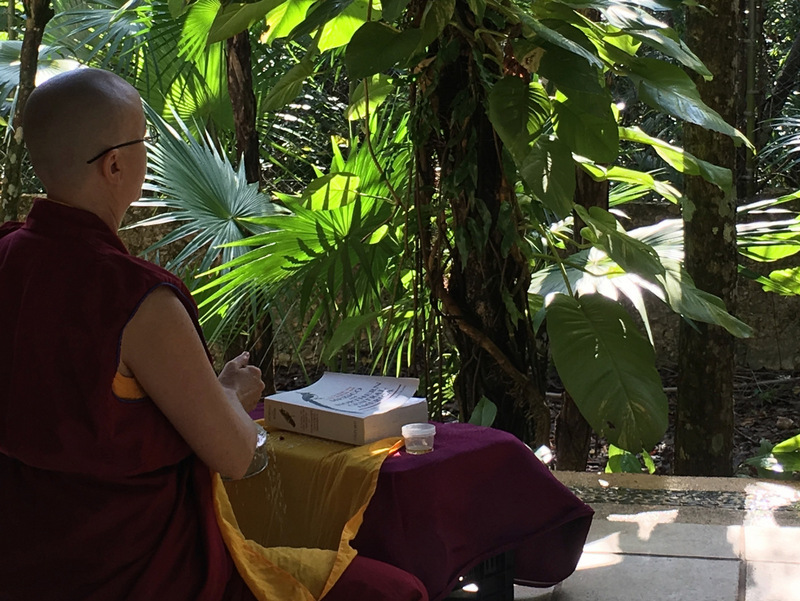 When we are not traveling to visit centers, lead retreats or receive teachings, we devote our mornings until 11 am to meditation practice. The remainder of the day is largely given over to creating material for our online study programs – which requires us to study ourselves, as we select readings for each session and immerse ourselves in the topics covered in the program – as well as giving talks online, leading distance retreats, preparing workshops (on gender identity, emotions, compassion etc), coordinating the numerous projects through which we reach the public and generally guiding our community in Latin America in its spiritual growth. In the evenings we do group practice, dedicating the merits of all we have done that day to our benefactors and to those who have specifically requested our prayers.